“The Shaolin Temple itself is a 1,500-year-old startup,” unexpectedly declares Shi Xing Mi, a Shaolin monk dressed in a mustard-coloured martial arts outfit. “It may sound like an oxymoron, but in Shaolin culture, being a startup is not a condition; it’s an attitude." 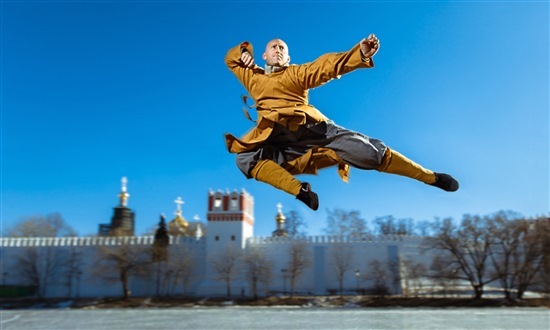 Shi Xing Mi performing kung fu moves at Moscow's Novodevichy Monastery earlier this year. Photo: www.shaolinshixingmi.com. What, you could be forgiven for asking, could a secular warrior monk of the 32nd Shaolin generation, know about business, startups and leadership skills? But Shi Xing Mi was not always Shi Xing Mi. He was once Walter Gjergja, a man of mixed European roots born in Italy, who had a meteoric career in business and finance before he decided to swap it for the life of a Shaolin disciple - the Buddhist monks known for centuries as masters of kung fu. After completing an economics and philosophy degree in Australia, Gjergja had, in his own words, “several normal jobs:” he was a consultant, then he worked for an investment fund, and by the time he was 27, he had listed a company on the stock exchange. Shi Xing Mi had first started practising Kung Fu at the age of 12, when one of the first Shaolin Kung Fu schools in Europe opened just a few hundred metres from his home in Italy. He went on to win Italian and European championships, before going to the Shaolin Temple itself in Henan province, China, to train for the world championships. “I had the fortune of being accepted by one of the masters of the monastery because I already had some good skills, and I realised the movements were only a function of something much deeper, which was this study of the human condition, body mind and spirit,” said Shi Xing Mi, adding that it was this discovery that prompted him to add the study of philosophy to his degree. After he realised his heart was not in a career in business, “a series of things happened, karma took me to where I want to be and made me decide to take the vows as a Shaolin disciple, and then I started teaching,” he says. Now Shi Xing Mi travels the world lecturing on how to achieve maximum results in business using the teachings of Shaolin culture. His clients have included major Western companies such as Google, BMW Group and Johnson & Johnson, as well as Russian audiences of Alfa Bank executives and corporate leaders. Shi Xing Mi addressing young entrepreneurs at Skoltech during the Startup Village. Photo: Irina Kremsa. 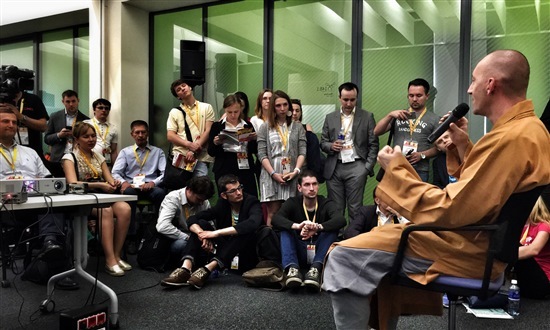 During his talk at Skoltech, held as part of the Startup Village event, the monk focused on business tips for startups. “There’s something in Shaolin culture we call “beginner mind:” to have this positive startup feel, regardless of how long you’ve been doing something,” he explained, before going on to outline the key Shaolin concepts needed for this frame of mind. 1. Begin with you. You are the one constant that defines your situation, your project. It’s the one element over which you have the most control. In Shaolin terminology, “you” is three components: the body, mind and spirit. You are the sum of these three elements, a mini-ecosystem. Take care of your eco-system: don’t think that one aspect is not important. Your body affects your mental performance, and it’s the same with your spiritual life. Don’t think you can work 15 hours a day and neglect your family, friends and loved ones. That neglect is going to have an impact on you on a spiritual level. 2. Take small steps. In Shaolin, we think revolutions are difficult, evolution is a far safer and healthier process. Build the castle one brick at a time, in a precise and structured way. 3. Embrace change. We tend to resist change, though it’s the most natural thing that can be in our lives. Life itself is a process of change, yet we are at best resistant, at worst fearful. Change can bring bad things, but it can also bring good things. It will happen anyway, so you may as well learn to flow with it, or even better, become an architect of change, starting with yourself. See change as an opportunity. 4. Focus on the present. The future is important, but we are building it today. We have a tendency to live a bit too much in the past and much too much in the future. The things we’re building for the future, we have to build today. 5. Focus more on the journey and a bit less on the destinations. In our society, whether at school or in the entrepreneurial world, we tend to base everything on targets and objectives. They are important, but they can be misleading: it’s like you have blinkers on and you may miss out on a lot of other opportunities. Maybe the target was right when you plotted the route, but not anymore. Targets and destinations are important, but don’t lose sight of the importance of the journey. Life is 99 percent journey and one percent destination. 6. Base everything you do on values. Don’t think about competencies, focus on values, such as respect, courage, dialogue, humility, passion. In Shaolin we have several that we think are fundamental values, but I don’t want to condition you: you should choose the ones that are most important to you. Don’t lose sight of those fundamental values you have, because they will give meaning to what you do, even in pure clinical business processes. I’m not just saying this as someone from a monastery wearing some strange clothes. I’ve had the fortune of working with some very innovative companies like Red Bull and Google, and they base their skills and performance assessments now more on values than on competencies, because that’s what will lead to entrepreneurial spirit. 8. Accept mistakes. Mistakes are fundamental to the Shaolin approach. We must accept them and even embrace them. We are here in his wonderful educational institution [Skoltech]. There is just one thing that can never be fulfilled by educational institutions: school and university are the opposite of life. At school, you study the lessons, you prepare, you do the exam. In life, you do the exam, then you learn the lesson. You have to embrace that process as the natural process of learning, especially if you’re trying new things, like developing a startup. And put love in what you do. It’s not enough to love what you do, there will always be tasks where you have to do hard work, but if you put love in what you do, you always see the direction, the journey. 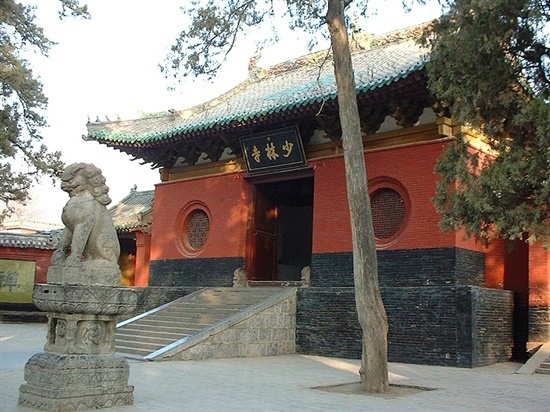 The ancient Shaolin Temple, the main temple of the Shaolin school of Buddhism, in Henan Province, China. Photo: Wikimedia Commons. Answering questions from the audience following his talk, Shi Xing Mi expanded and explained his tips for the would-be entrepreneurs packed into the room. A good team is one that shares the same values, he said. “You don’t need investment or a budget for respect, you don’t need software or new machines. You just need to understand the importance of the values and make them part of how you interact. There are no excuses, you can’t forget about them. And it has to come from the leaders, to implement fundamental core values from beginning,” he urged. What, then, should you do if you find yourself working with someone who you realize does not share the values of the team? Can anyone really start a business? wondered one of those present. “If you talk to old people, you’ll find they never regret that they did do something – only what they didn’t dare to do. If in doubt, take a chance: at least you tried,” was the monk’s advice. And for those who dream of an easy life at the helm of their own successful startup, Shi Xing Mi had some sobering words. “To do what you love can be very hard – it can be much harder than doing what you do because it’s easy,” he said. “I had to make many sacrifices to do what I love. Imagine telling my parents I will quit a very fast successful corporate career at the age of 28 to become a Shaolin disciple and teach around the world. Imagine going from earning a very big salary at 28 to earning no salary at 29, and a much lower salary at the age of 44 than I did almost 20 years ago. It can be a very tough choice. Do what you love but be prepared for the challenges, because they will be part of it,” he said. Asked for advice in three words, Shi Xing Mi smiled.